The FBI Violent Crime Task Force needs the public's help identifying and locating a man dubbed the "Sunglasses Suspect." He struck a Chase Bank in southwest Harris County on Monday. Crime Stoppers of Houston is offering a reward of up to $5,000 for information that leads to the identification and arrest of the robber. 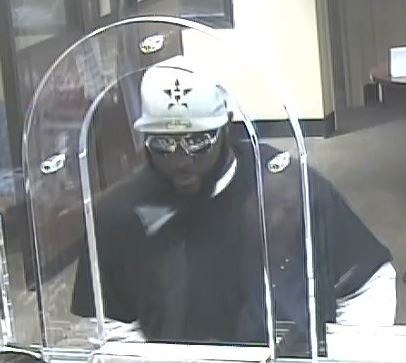 The robbery occurred at approximately 10:10 a.m. on Monday, April 8, 2019 at the Chase Bank located at 6701 South Highway 6 in southwest Harris County, TX. The suspect entered the Chase Bank, approached the counter, and handed the teller a threatening note demanding cash. The suspect fled the bank empty-handed and on foot. No one was physically hurt during the robbery. The robber is described as a black male in his late 30s, approximately 6'1" tall, with an athletic build. He had a full beard and wore a navy t-shirt on top of a long-sleeved white shirt, a white Houston Astros baseball cap, and a large pair of aviator-style, mirrored sunglasses. Idiot. That is the most solved crime. @SugarLandDotCom : I hope he's caught and the PD gets additional information on him and his whereabouts.